Bollage is a simple image collage application. 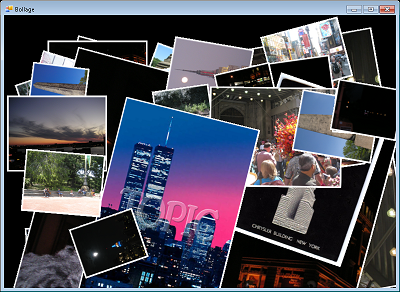 There are some collage screen savers, but a quick search did not turn up any applications that you can run that display a collage of pictures without being in screen saver mode. I have multiple monitors so it is nice to run in a side monitor and see all the pictures I have taken over the years. Beats a single Windows Gadget that only displays a single image. The window can be any size that you want it to be. I wrote this very simple application (free, enjoy) and I have included the source code in case anyone wants to use in within their non-commercial applications. I will most likely use this code in one or more applications that I am currently working on or that I am currently designing. August 2, 2011. I created a multi-monitor enabled screen saver version. It is available below, along with the source code. June 17, 2011. Bollage recieved a minor update. It can now load multiple folders, as many as the user requires. The Select Folder dialog appears repeattly until the user presses Cancel. 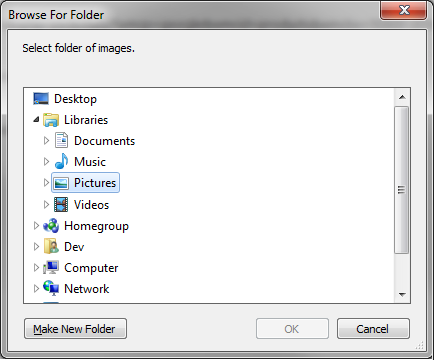 When you start Bollage you see this dialog asking you for a folder that contains images. Once you select a folder and press "OK", the Bollage displays a random picture for that folder at a random size and position. This application will run forever taking the next random image. There is no installation for Bollage at this time.